Not to be confused with Original sin. 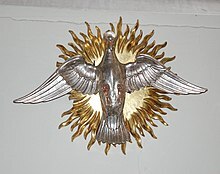 The Holy Spirit represented as a dove, Mitteleschenbach, Germany. In Christian hamartiology, eternal sins, unforgivable sins, or unpardonable sins are sins which will not be forgiven by God. One eternal or unforgivable sin (blasphemy against the Holy Spirit) is specified in several passages of the Synoptic Gospels, including Mark 3:28–29, Matthew 12:31–32, and Luke 12:10. Impugning the known truth (to argue against known points of faith, and this includes misrepresenting parts or all of the Christian faith to make it seem undesirable). Matthew 12:30-32: "Whoever is not with me is against me, and whoever does not gather with me scatters. And so I tell you, any sin and blasphemy can be forgiven. But blasphemy against the Spirit will not be forgiven. Anyone who speaks a word against the Son of Man will be forgiven, but anyone who speaks against the Holy Spirit will not be forgiven, either in this age or in the age to come." 28 - Verily I say unto you, All sins shall be forgiven unto the sons of men, and blasphemies wherewithsoever they shall blaspheme: 29 - But he that shall blaspheme against the Holy Ghost hath never forgiveness, but is in danger of enternal damnation: 30 - Because they said, He hath an unclean spirit. Luke 12:8-10: "I tell you, whoever acknowledges me before men, the Son of Man will also acknowledge him before the angels of God. But he who disowns me before men will be disowned before the angels of God. And everyone who speaks a word against the Son of Man will be forgiven, but anyone who blasphemes against the Holy Spirit will not be forgiven." According to the Catechism of the Catholic Church §1864, while God's mercy is great, anyone who deliberately refuses to accept his mercy by repenting, rejects the forgiveness of his sins and the salvation offered by the Holy Spirit. Such hardness of heart can lead to final impenitence and eternal loss. obstinacy, whereby a man, clinging to his sin, becomes immune to the thought that the good searched in it is a very little one. Thomas Aquinas explains that the unforgivability of blasphemy against the Holy Spirit means that it removes the entrance to these means of salvation; however, it cannot hinder God in taking away this obstacle by way of a miracle. However, the Church further believes there is no offence, however serious, that cannot be taken away by Baptism, or absolved from in the Confessional—that no one, however wicked and guilty, may not confidently hope for forgiveness. The Catechism says that Christ desires "the gates of forgiveness should always be open to anyone who turns away from sin." As did St Augustine, the Catholic Church today teaches that only dying unrepentant for one's sins is the only unforgivable sin. Indeed, in Dominum et vivificantem Pope John Paul II writes "According to such an exegesis, 'blasphemy' does not properly consist in offending against the Holy Spirit in words; it consists rather in the refusal to accept the salvation which God offers to man through the Holy Spirit, working through the power of the Cross", and "If Jesus says that blasphemy against the Holy Spirit cannot be forgiven either in this life or in the next, it is because this "non-forgiveness" is linked, as to its cause, to "non-repentance," in other words to the radical refusal to be converted. This means the refusal to come to the sources of Redemption, which nevertheless remain "always" open in the economy of salvation in which the mission of the Holy Spirit is accomplished." Protestant denominations and theologians have taken various approaches in defining the sin against the Holy Spirit. I say, therefore, that he sins against the Holy Spirit who, while so constrained by the power of divine truth that he cannot plead ignorance, yet deliberately resists, and that merely for the sake of resisting. Similarly, Jacob Arminius defined it as "the rejection and refusing of Jesus Christ through determined malice and hatred against Christ". However, Arminius differed with Calvin in believing that the sin could be committed by believers, a conclusion he reached through his interpretation of Hebrews 6:4–6. that the penalty of eternal separation from God with no hope of return applies in scripture only in two cases—either, as in Hebrews 6 and 10, to persons who willfully, publically [sic] and explicitly reject Jesus as Savior after having confessed him, or, as in the gospels, to those who blaspheme against the Holy Spirit by declaring that the works of Jesus were the works of the Evil one. According to Billy Graham, refusing to turn to God and accept his forgiveness is the eternal sin. Regardless of their interpretation, Protestant interpreters generally agree that one who has committed the sin is no longer able to repent, so one who is fearful that they have committed it has not done so. All sins shall be forgiven, except the sin against the Holy Ghost; for Jesus will save all except the sons of perdition. What must a man do to commit the unpardonable sin? He must receive the Holy Ghost, have the heavens opened unto him, and know God, and then sin against him. After a man has sinned against the Holy Ghost, there is no repentance for him. He has got to say that the sun does not shine while he sees it; he has got to deny Jesus Christ when the heavens have been opened unto him, and to deny the plan of salvation with his eyes open to the truth of it; and from that time he begins to be an enemy. Lincoln's House Divided Speech Which also references the episode in Matthew Chapter 12 and Mark Chapter 3. ^ Fr. Vincent Serpa O.P. (2011-08-04). "What is the sin of presumption? | Catholic Answers". Catholic.com. Retrieved 2018-04-05. ^ "The Six Sins Against The Holy Spirit - Traditional Catholicism - Catholic Answers Forums". Forums.catholic.com. Retrieved 2018-04-05. ^ a b "What are sins that cry to heaven for vengeance and sins against the Holy Spirit? | Catholic Answers". Catholic.com. Retrieved 2016-11-21. ^ a b Forget, Jacques (1910). "The Catholic Encyclopedia - Holy Ghost". www.newadvent.org. Robert Appleton Company. ^ It must be mentioned in this place that the death-bed prayer of repentance is a meritorious act. ^ Repentance itself need not be perfect repentance, i. e. as long as there is sorrow for the sin from love, or in the Sacrament of Penance fear, of God, and some will however weak to avoid grave sin and its nearest opportunities furtheron, there can be repentance: and it is better to repent from a sin and do it again, waiting maybe for a better time for another completer repentance, than not to repent from it at all until a perfect time in order to certainly never sin afterwards. ^ (This is also the Lutheran doctrine. See "The Defense of the Augsburg Confession," Article XI, Of Confession, paragraph 59, and Article XIII, Of the Number and Use of the Sacraments, paragraphs 4 & 5.) Roman Catechism I, 11, 5. ^ "Catechism of the Catholic Church - IntraText". Vatican.va. Retrieved 2016-11-21. ^ "James Akin". Ewtn.com. Retrieved 2016-11-21. ^ "What about Matthew 12:31–32, which says that anyone who speaks against the Holy Spirit will never be forgiven? | Catholic Answers". Catholic.com. Archived from the original on 2016-05-20. Retrieved 2016-11-21. ^ "Library : The Unforgiven Sin". Catholic Culture. 2011-05-13. Retrieved 2016-11-21. ^ "Dominum et vivificantem (18 May 1986) | John Paul II". Vatican.va. Retrieved 2016-11-21. ^ Burton-Edwards, Taylor (2012). "Do United Methodists believe "once saved, always saved" or can we "lose our salvation"?". The United Methodist Church. Archived from the original on 1 December 2012. Retrieved 14 June 2012. Wesley notes that the penalty of eternal separation from God with no hope of return applies in scripture only in two cases—either, as in Hebrews 6 and 10, to persons who willfully, publically [sic] and explicitly reject Jesus as Savior after having confessed him, or, as in the gospels, to those who blaspheme against the Holy Spirit by declaring that the works of Jesus were the works of the Evil one. ^ "Is there any sin that God can't forgive?". Billygraham.org. Retrieved 2016-11-21. ^ "The Unpardonable Sin". Cbn.com. Retrieved 2016-11-21.